We will provide training to members and workers who handle pesticides and other hazardous chemicals on the risks of handling these materials and on how to handle them properly. intervals of time when people are not allowed to enter a sprayed area or field without any personal protection equipment. We must also raise awareness of the risks and issues associated with using of pesticides and other hazardous chemicals and make sure farmers know the risks involved. This is a core requirement for Fairtrade. 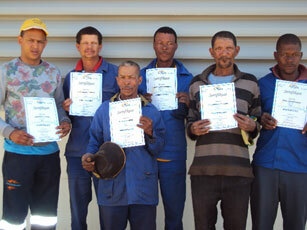 Eksteenskuil farmers and workers with their certificates for PPE training. 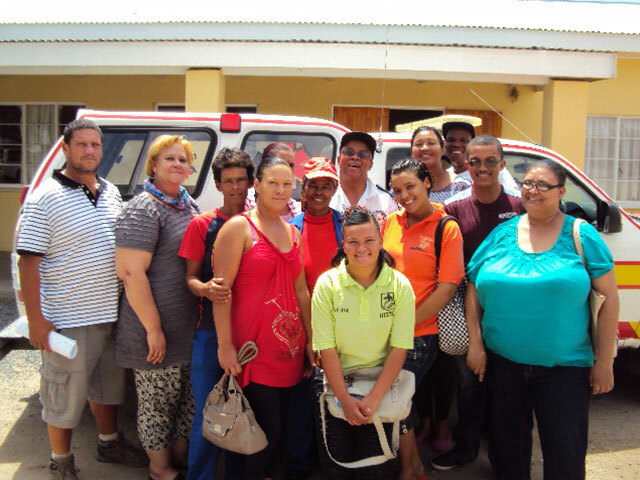 The Eksteenskuil Agricultural Cooperative had First Aid level 1 training in November 2016 for their farmers and workers. Working on a farm can be dangerous. There are risks from using machinery, from equipment, from chemicals and from insect and animal bites. Many of our farms are a long way from the clinics and the hospital too. It is important to us that our farmers, the workers and their families are safe and can receive first aid quickly and effectively. This government approved training will make sure that there is a number of well trained people working in our community who can administer first aid and then make good decisions about whether further treatment is necessary. This treatment will prevent further problems and may save lives. 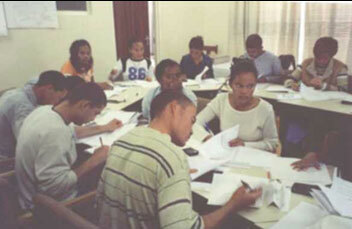 ARC Infruitec-Nietvoorbij has been providing training and technology transfer to previously disadvantaged producers of the Eksteenskuil community near Keimoes in the Northern Cape since 1997. Mr. Danie van Schalkwyk from ARC Infruitec-Nietvoorbij has been the project leader since 2003. The Eksteenskuil community farmers produce mainly raisin grapes, but also some wine grapes. The training and technology transfer were initially funded by the ARC, Dried Fruit Technical Services and Winetech, but since completion of the first phase of the project in 2009, funding was provided by the ARC and Winetech only. A socio-economic investigation was done in the beginning to identify the problems and needs of the community. Following this investigation, training related to viticultural management practices and technology transfer regarding the latest research results, have been provided by means of annual workshops and farmers’ days. Technology transfer across the whole value chain of grape production was offered over the years; from the grafting of the vines to wine in the bottle or packaged raisins at SAD (Photo 1). Researchers from ARC Infruitec-Nietvoorbij and experts from other institutions such as Vinpro, SAD, SAWIT, University of Stellenbosch, University of Free State, Oranjerivier Wine Cellars (OWC), private viticultural consultants, agrochemical companies such as Terason, Nulandis, and others, fertilizer companies and commercial financial institutions such as ABSA, were co-opted to participate in the transfer of new technologies. 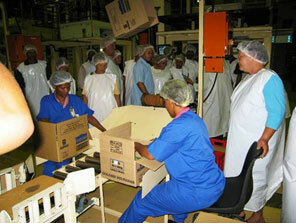 SAD workers explaining the processing and packaging procedures to Eksteenskuil farmers. The purpose of this project is to empower the farmers with the viticultural knowledge as well as financial and management skills required to produce high quality grapes and for their farming operations to be economically sustainable. The project also aims to put producers in touch with organizations that can assist them to access land to increase the size of their vineyards, thereby creating additional job opportunities for the community. One of the most important aspects of a profitable farm is the application of sound business management practices. 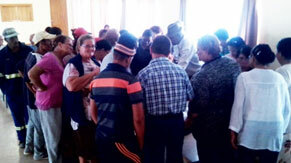 Mrs. Odette Beukes presented a course in basic business skills on Sand Island (Photo 2) which helped the attendees to improve financial management on their farms. 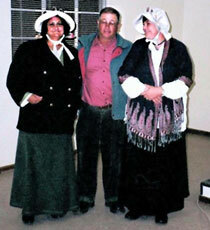 (Left) Mrs. Odette Beukes from ARC Infruitec-Nietvoorbij with Mr. and Mrs. Coetzee of Eksteenskuil during a basic business management and skills workshop. (Right) course attendees doing their assignments. Producers were also trained oi the importance of proper soil preparation before new vineyards are planted. During one of these farmer’s days a profile hole was dug in a vineyard to show the positive effect of proper soil preparation on grapevine root development. 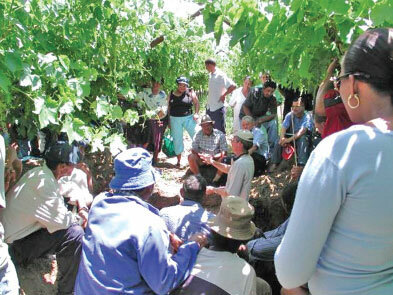 Mr. Dirk Malan (formerly of Vinpro) explaining the effect of proper soil preparation on root distribution of a grapevine. The importance of choosing the best rootstock for each farm’s soil type and of using only certified grafted vines from nurseries registered with PlantSA, was emphasized. 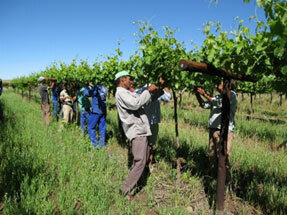 Planting only the best quality vines enables farmers to produce high quality grapes. Sometimes the scion of newly planted vines dies due to frost and cold, but the rootstock survives and grows again. Producers were taught to replace the scions on these rootstocks by aerial grafting. Mr. Hans Maasdorp busy practicing the technique of aerial grafting. Making use of the best trellising system for specific grape varieties to utilize the full production potential of a variety is also important. 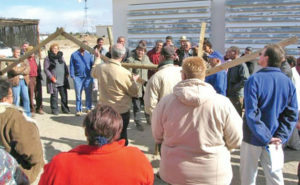 The producers were taught how to construct a small Gable trellis system (Photo 5). Although the gable trellis system is more expensive than the T-system which is normally used in this area for raisin and wine grapes, it enables farmers to increase yields significantly. For this reason, the gable system was also used in raisin grape vineyards in the Work for Jobs project in the community. 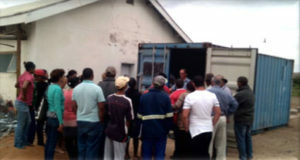 Mr. Leon Laubscher (SAD) and André Schmidt (ARC Infruitec-Nietvoorbij) demonstrating the construction of a gable trellising system to Eksteenskuil farmers. Optimal production of good quality grapes for drying and wine making also requires correct pruning of vines. Different pruning methods are used for different varieties and different types of grapes (i.e. for drying or wine making). 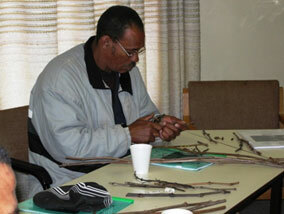 Several training sessions on pruning of wine and raisin grapes were presented over the years. Producers were taught to develop wine grapes on a split cordon and pruning short bearers, rather than cane pruning as they were accustomed to doing (Photo 6). This method of pruning is much less labor intensive than cane pruning, as in the case of Merbein and Sultana. This not only reduces labor costs, but also ensures grapes with a more uniform must that is beneficial for production of good quality wines. This pruning method requires vines to be suckered correctly to ensure sufficient light within the canopy. 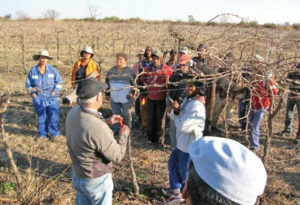 Mr. Danie van Schalkwyk training Eksteenskuil farmers how to prune a grapevine with a double split cordon with two-bud short bearers. Producers applying canopy management in a Colombar vineyard during practical training. Weeds are a major problem in flood irrigated vineyards. Competition between wees and grapevines for water and nutrients result in decreased growth and yield of the vines. Effective weed control is therefore very important. Several hands-on training sessions were held to train producers in effective weed control and calibration of herbicide spray pumps (Photo 8). Producers were also trained in safe handling and application of pesticides safely, as well as how to mix and apply the correct concentration of herbicide. 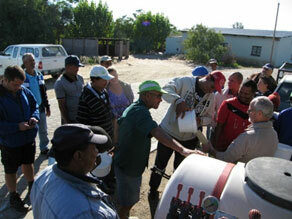 Danie van Schalkwyk training Eksteenskuil farmers to calibrate a herbicide sprayer. Pest and disease control is crucial for producing healthy, high quality grapes. Although training was offered in this regard on several occasions already, a recent audit found that many of the producers still did not have sufficient knowledge to identify the different diseases and pests. A lack of knowledge of how to control these pests and disease was also identified. On 18 October 2016 Mr Abraham Vermeulen and Danie van Schalkwyk again held a workshop on identifying different pests and diseases of grapevine. Several examples were available so that the producers could see the different pests and symptoms of fungal diseases (Photo 9). Downy mildew and powdery mildew are the two main fungal disease along the Orange River. Many producers are getting confused by the symptoms of these two diseases and in their confusion producers then apply the wrong chemical control, resulting in poor control of the disease. Those who attended the workshop should have no problem with the identification of these diseases in future. Various monitoring techniques of pests and diseases, as well as use of environmentally friendly sprays were also dealt with. One of the major shortcomings of many producers is that their agrochemical stores do not legal safety standards, resulting in negative audit reports. During the workshop, Mr. Vermeulen led a site visit to an agrochemical store at Eksteenskuil where all the aspects that needed correction to comply with the legal regulations, were identified. 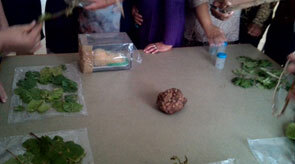 Mr. Abraham Vermeulen with Eksteenskuil farmers showing the different pests and diseases (Right). Another important factor that was dealt with in the workshop of October 2016, was the issue of occupational health and safety regarding the handling of all pesticides on the farm. Safe and secure storage of chemicals is very important. It will help to prevent unnecessary exposure (by either inhalation of fumes, contact through the mouth or skin) of people and animals to chemicals that are on the farms. Mr. Vermeulen highlighted the safe storage of pesticides to ensure that the producers who attended the training are thoroughly aware of the potential risks and measures that should be taken to mitigate these risks. Mr. Abraham Vermeulen explained which aspects of this storage facility do not comply with the legal regulations. The producers who attended the workshop, received a full color manual for the identification of pests and diseases, as well as other useful information about grapevine abnormalities and nutrient deficiency symptoms. The guide also included helpful information on pest and disease control measures and correct application of sprays. 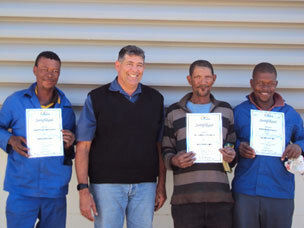 The producers also received a certificate that they attended the workshop and training. When a farmer is audited, he/she has proof training received in this regard and is equipped with the necessary knowledge to apply pest and disease control measures responsibly. 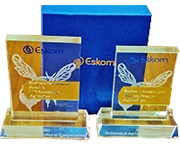 A follow-up workshop will be held in 2017 for producers of the Eksteenskuil community who could not attend the 2016 workshop. We thank Winetech and Dried Fruit Technical Service for the original funding until 2009, and Winetech for continued funding of this empowerment project. 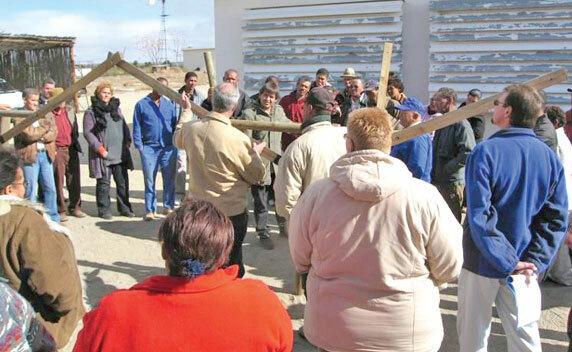 The project has already made a major contribution to the application of improved vineyard management practices and improving the socio-economic conditions of Eksteenskuil producers. It also created new jobs.